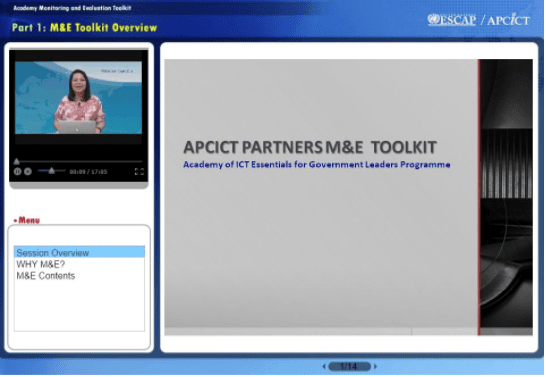 The Academy Programme M&E Toolkit will help the partners develop and strengthen the M&E system in their institutions. It will assist the partners in determining very important inputs, activities, tools, and resources needed to design, build or improve and implement an appropriate M&E system. Specifically, the Toolkit will assist partners in customising their M&E system through providing important information. 1 Basics of Monitoring and Evaluation: Presents an overall guide in designing the Academy partners' M&E system. 2 Conducting Monitoring and Evaluation: Defines what information you want to know about your performance and how to get that information reliably and validly. 3 Strengthening the Monitoring and Evaluation System: Presents the different parts or components of an M&E system so that it can reliably and sustainably obtain the information needed by the partners and APCICT. Ensure efficiency, effectiveness and continuous improvement of the M&E system. Strengthen the M&E structure and improve M&E continously. Ms. Ruth D. Gerochi has brought her expertise in serving and assisting leaders in national and local governments, and in corporate and community settings in South East Asia. Over her 27 years of professional experience, she has developed, managed and evaluated major programs in multi-sector collaboration and participation, and in strengthening governance and service delivery mechanisms of private and public organizations. Her expertise has been applied in social health issues, especially in reproductive health, in natural resources and environment protection and development, communications development, poverty alleviation and business development for small and medium enterprises. She has likewise designed major programs for rehabilitation and empowerment of groups and communities affected by major social changes.